I thought I'd write about how to support a breastfeeding mum. After watching a documentary on the television a few months ago, it really got me thinking about the lack of support given to mums once they've chosen to breastfeed. It really does seem like a postcode lottery when it comes to breastfeeding support post-pregnancy. When I was pregnant, I'd often be asked, by healthcare professionals, whether or not I was going to breastfeed. At the time, I wasn't sure which triggered a lot of talk about the benefits to breastfeeding, etc. However, it seems that once a mum has ticked the box to say they will breastfeed, then that's it. 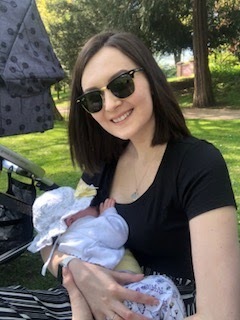 So, I thought I'd make a post on how you could offer your support a new mum on her breastfeeding journey. Breastfeeding is hard. I was naive enough to think that you simply pop the baby to breast and that's it. It's not. It's hard. Of course, parenting in general is hard, but when you're trying to learn the ropes on top of making sure your baby is fed and some of the classic breastfeeding issues arise, then it can just become a nightmare. Whether you like seeing a woman breastfeeding in public is, quite frankly, irrelevant, but offering a small smile really does go a long way. 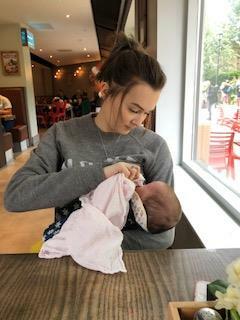 It helps to relieve the worry, that I'm sure most mums feel when they feed in public for the first time, and that it's ok and it's really not that big of a deal. Breastfeeding can really make a mum go through the emotions, especially when it's the first-time. I know from my own experience, as well as some of my close friends. There's constant worrying that baby is getting enough, or battling through pain, or just dealing with cluster feeds which can last for a long time, as well as many other complications. So, just be kind. You never truly know what someone is going through. Once baby has finished their nursing session, trying to put yourself away discreetly, with a baby in your other hand, requires some skill and can be difficult. Offer to take the baby for her, so she can sort herself out. Trying to clip your bra back on, or wipe off any spit up residue can prove difficult with a wriggly baby in your arm! Even being on standby with a muslin square can be very helpful! Breastfeeding is thirsty work. I try not to start feeding Edith, unless I have a drink next to me in case I become booby trapped. I also aim to drink 2.5 litres of water a day, which can sometimes be hard, especially when being caught up in looking after Edith that I forget about my self - mum life, eh? The last thing any mum really wants is unsolicited advice or opinions. Is it really helpful? Don't get me wrong, sometimes it is, but sometimes it really can have a negative impact on her thoughts. Quite often you hear 'I couldn't do that', or 'just use formula'. Now, I have absolutely nothing against formula, and of course Edith would have had it if she needed it, but hearing 'just give formula'. was so frustrating for me. I felt so determined to breastfeed and hearing that almost made me doubt myself, and whether I really wanted to do it. Are there anyways that you wish you'd been supported on your breastfeeding journey?